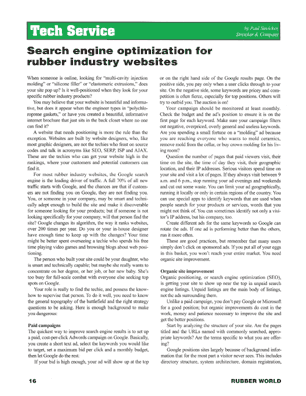 Rubber World, the leading technical publication serving the rubber industry, has published a feature article on search engine optimization written by Paul Streicker, president of Streicker & Company Inc.
Streicker & Company Inc. is a business-to-business advertising and public relations agency located in East Providence, RI. Its services include B2B and B2C advertising for manufacturers; public relations, especially free editorial in trade publications; tradeshow displays and graphics; and website development, maintenance and positioning. To view or download the published article, click here.